The winners of HSL's IdeaLab competition are ViaVan Technologies B.V. who are offering on-demand ridesharing services and Samocat Sharing Oy, who are bringing public kick and electric scooters to the streets of Helsinki. The pilot schemes for these new mobility services will start in the HSL area next year. Soon there will be two new public transport options in the HSL area: an on-demand ridesharing service and city scooters. From next year, HSL and the winners of the IdeaLab competition will pilot both services. The winners of HSL’s IdeaLab competition were ViaVan Technologies B.V. and Samocat Sharing Oy. The total prize money in the competition was one million euros for developing new mobility services. HSL will immediately start negotiations with the winners on the implementation of the pilots. HSL and ViaVan Technologies B.V. will trial a new kind of on-demand ridesharing service in the Espoo area. The pilot complements HSL's public transport services by introducing a flexible ridesharing service to facilitate the travel of commuters and residents in the area. “The service combines the best of different transport modes as rides are available door to door or to the nearest metro station, almost as flexible and fast as a taxi or a private car. Ride-pooling makes the trips inexpensive and the customer does not have to look for parking spaces or pay parking fees,” says Jouni Wallander from Solita Oy, who was part of the IdeaLab jury. A passenger requests a ride to a target destination on a mobile application. The system’s back-end algorithms combine passengers and routes so that the passenger reaches the virtual stop closest to their destination as quickly as possible. HSL and Samocat Sharing Oy will for the first time bring foldable kick scooters and electric scooters for residents and tourists to test in the HSL area. “This service is a wonderful example of future micro-mobility services. 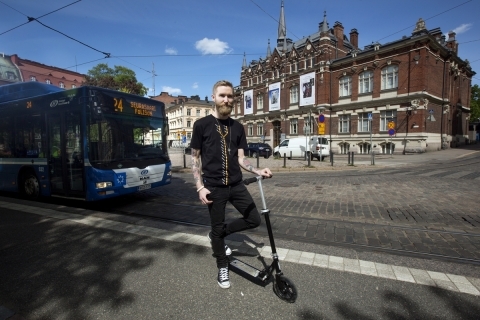 Scooters are a convenient way to travel the first and last kilometers of a journey,” says member of the jury Tiina Kähö from the Smart & Clean Foundation. During the pilot, the service will be available through its own application. “People have fallen in love with HSL area’s city bikes. Shared scooters will continue the positive trend: traveling by walking or cycling is enjoyable and healthy, and by sharing we reduce the impact on the environment as people have less need to purchase their own equipment,” says HSL’s Director of Department Mari Flink. Launched in June, HSL’s IdeaLab competition sought for new interesting mobility solutions that would update HSL’s current offering. The competition received 26 entries. “From the competition we wanted to find services that excite people and make the everyday travel of residents in the Helsinki region easy and convenient. It looks like we achieved this,” says HSL’s Executive Director Suvi Rihtniemi. “We received versatile and high-quality entries, and hopefully, in addition to the winners, we can work with some of the others to develop their ideas into new services in the HSL area,” says HSL’s MaaS Project Manager Jemina Uusitalo, who ran the competition.